A painting is termed a still life when it depicts images of inanimate objects that are specifically arranged. These objects could be natural ones such as skulls, rocks, dead animals, game, insects, plants, flowers or food or artificial object like pipes, books, drinking glasses, jewelry, domestic utensils or vases. The term was derived from “Stilleven,” a Dutch word. Due to the influence of the Protestant Dutch Reformed Church in the 17th century, still life paintings developed in Holland as support for religious art declined. With the emergence of an affluent middle class, consisting of bourgeois professionals and traders, a new group of art patrons emerged, who looked for landscapes, still lifes and portraits for their homes. This demand gave birth to the Dutch Realist schools in Delft, Leyden and Utrecht, which produced distinct masterpieces known not only for their narrative and symbolism but also for their linear perspective, tonal values, composition and varnish. 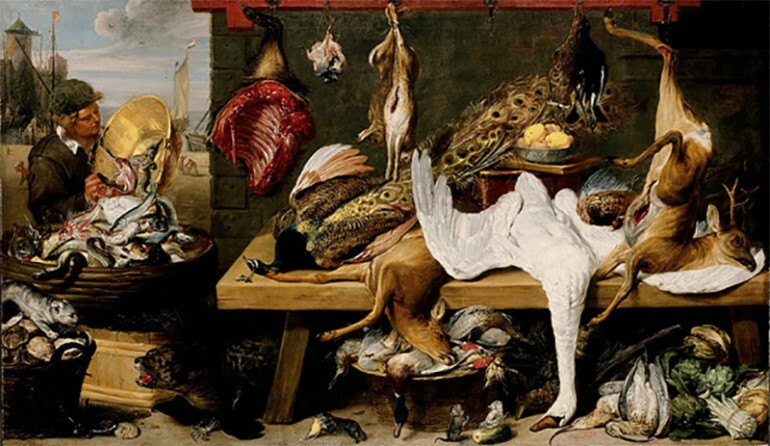 Frans Snyders (Frans Snijders) was born on November 11, 1579 in Antwerp. He was known for his still lifes, market scenes, hunting scenes and paintings of animals. Snyders received art lessons from Pieter Brueghel the Younger. He often collaborated with top Antwerp painters like Jacob Jordaens, Anthony van Dyck and Peter Paul Rubens, and together with Jan Brueghel the Elder formed Antwerp into a center for art. Snyders is one of the first of the Dutch Old Masters, and was unquestionably Northern Europe’s master of animal subjects and still life painting during the Baroque period. He had the unsurpassed ability to show a variety of textures such as metal, glass, fur and skin. Snyders was also an outstanding animal painter (animalier) and often included a variety of dead animals in his still life paintings, which often showed a touch of action. As a collaborator, he would, at times, paint a still life portion to a painting being done by Peter Paul Rubens, who is one of his close friends. 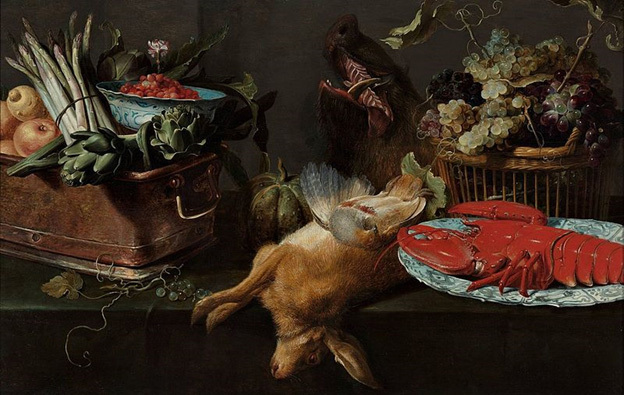 He was the first Flemish artist to specialize in animal still lifes and truly made a name for himself in this category. His compositions were always well balanced and quite distinct for their complexity and energy. Due to his frequent collaboration with Rubens, some patrons became confused about their work. While they were friends, Rubens was quick to point out that he was a better painter than Snyders when it comes to live animals. Snyders on the other hand was unsurpassed in painting dead animals. Although known as an animalier, Snyders was also skilled in figure painting. The Ghent Bishop Antonius Triest was only one of his many patrons. The bishop had commissioned him to do four market scenes in 1615, which are now at the Hermitage Museum in Saint Petersburg. Due to his commercial success he was able to buy a house in Keizerstraat, which is an affluent neighborhood in Antwerp. In 1628 Snyders was named as the dean of the Guild of Saint Luke, which was founded in Antwerp around the latter part of the 14th century. Saint Luke is the patron saint of artists. When Rubens received a very large commission to decorate a hunting pavilion of Spain’s King Philip IV, called the Torre de la Parada, Snyders was one of several artists that he called to help him. They also collaborated on the decorations for the Buen Retiro royal palace and the Royal Alcazar, both in Madrid. From the designs of Rubens, Snyders painted about 60 animal pieces and hunting scenes and an additional 18 paintings to decorate the hunting pavilion. Their collaboration started in 1610 and lasted until 1640. Well-known works that these two Flemish masters did include “The Recognition of Philopoemen” that is now at the Prado Museum; “Medusa,” which is at the Kunsthistorisches Museum in Vienna and “Prometheus Bound” (Philadelphia Museum of Art). Due to his popularity, Snyders had several apprentices, such as Jan Fyt, Paul de Vos, Jan Roos, Juriaen Jacobsze, Peter van Boucle and Peter van Boucle. Snyders’ works were hugely influential on the art of French animaliers of the 18th century, such as Jean-Baptiste-Siméon Chardin, François Desportes and Jean-Baptiste Oudry.